While expensive analysis and drilling are needed to tap heat (usually in the form of steam) from the earth’s deep geothermal wells, there are fortunate areas that have surface reservoirs of hot water. Hot springs are common throughout the western United States and can be tapped as a renewable energy source. When a hot spring is found on property near a building, simply pumping hot liquid to heat registers or a holding tank may be acceptable. In some cases where the surface water may be bubbling at near boiling temperatures (212 F/100 C), the water may be collected into an insulated pipeline and moved to a hydronic distribution center in a building. If the water source is higher than 50° F, the thermal resource can often be used for purposes other than warming buildings. Commercial hot springs are the most prevalent example, but other opportunities exist. Warm surface water is often diverted and mixed with cooler water for irrigation to grow crops or for use in greenhouses (though direct contact with foodstuffs may require testing for microbes and other organic contaminants). Direct use is also used in foodstuff processing, such as pasteurizing milk. In some ranch locations, such spring surface waters are being used to raise alligators and other exotic species normally found in more hot and humid locations. In fact, several locations in Alaska, not far from the Arctic Circle, such springs are being used for domestic heating. Proximity to the end use is always a lynchpin, as naturally heated water will lose heat quickly in the transportation through pipes and channels. fuel is important – ASHPs are most practical where electricity prices are relatively low. ASHPs work by the same principles as GSHPs, but they do not require a ground loop and are thus lower in cost. 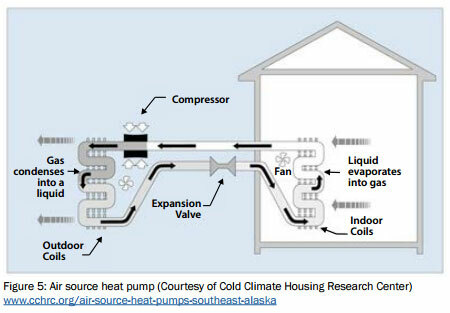 ASHPs, as with GSHPs, do not convert electricity into usable heat but rather exchange heat from air (utilizing the transition of liquid to a vapor state inside piping and coils to be condensed back again into a liquid state). The heat brought in from outside can be, as with GSHPs, used to heat air that is blown by a fan(s) through ducts. The heat can also be brought through a ductless heat pump (DHP), which runs through an outside set of coils, then piped into a heat exchanger inside the building. These units often are mounted like an air conditioner, protruding through the outer wall, so the useable heat exits out of the interior portion of the boxed unit and rolls off the wall. There are also ventilation heat recovery systems in which stale indoor air is run through a heat exchanger to surrender its heat to the incoming fresh air. Finally, air to water heat pumps can utilize outdoor or ventilated air to transfer heat to water that then goes to baseboards, in-floor tubing, or storage tank heating. In each case, the heating season performance factor (HSPF) and coefficient of performance (COP) are examined to gauge overall cost effectiveness.